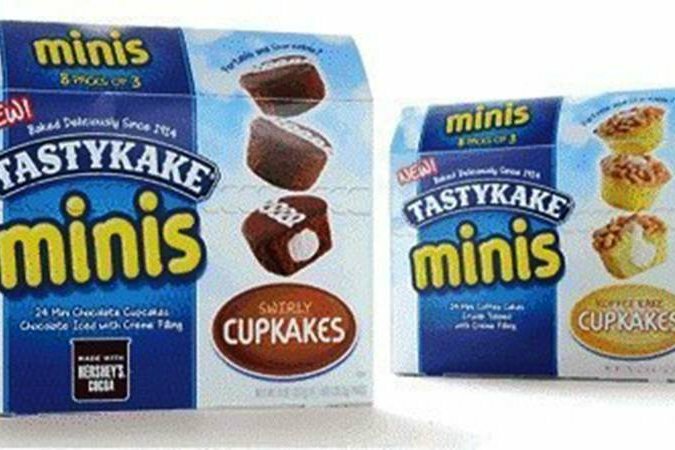 Tastykake has rolled out a new product: mini cupcakes, in three varieties. Philadelphia's favorite pastry maker, Tastykake, is expanding its delicious roster of treats with a brand new line of Mini Cupcakes that will make you think twice before you reflexively yoink a packet of Butterscotch Krimpets next time you're at the supermarket. The company announced Friday that the new line of snacks will feature miniature versions of two current classics, which will include brand ingredients from Reese's and Hershey's, and a third addition that will rival some of the brand's staple delights. First up is the Mini Peanut Butter Swirly Cupcake, a chocolate pastry with filled with peanut butter creme and topped with Reese's peanut butter icing. Next up, the Mini Swirly Cupcake, which is a chocolate cake topped with Hershey's Cocoa icing and filled with white creme. Last but not least, the company is rolling out a crumb covered, cream-filled Mini Koffee Kake Cupcake. Those who are trying to be more conscious of their diet without having to relinquish Tastykake treats will appreciate that the new offering comes in $3.99 boxes that contain eight packs, each including three mini cupcakes that make up a serving size of 200 calories. "We're thrilled to provide mini versions of classic and new Tastykake treats for fans to enjoy and expand our flavor offerings," said Brent Bradshaw, Flowers Foods' vice president of cake marketing. "These new treats are great for sharing and conveniently packaged for both on-the-go and at-home snacking." The local company, established in 1914, now serves the East Coast, South and Southwest. The latest snacks will join Tastykake's classic Krimpets, Kandy Kakes and Juniors as the company makes its move into market that increasingly values bite sized morsels.